Random Post Tags, in different size, position and opacity, animated horizontally in various speed, over a background image. An elegant decoration element for your pages. Adjust the height of the element. Adjust the density of the tags. Use shortcodes to embed the element anywhere in your pages. Use multiple instances of the plug in in one page. Activate ACTUS Animated Tags from your Plugins page. 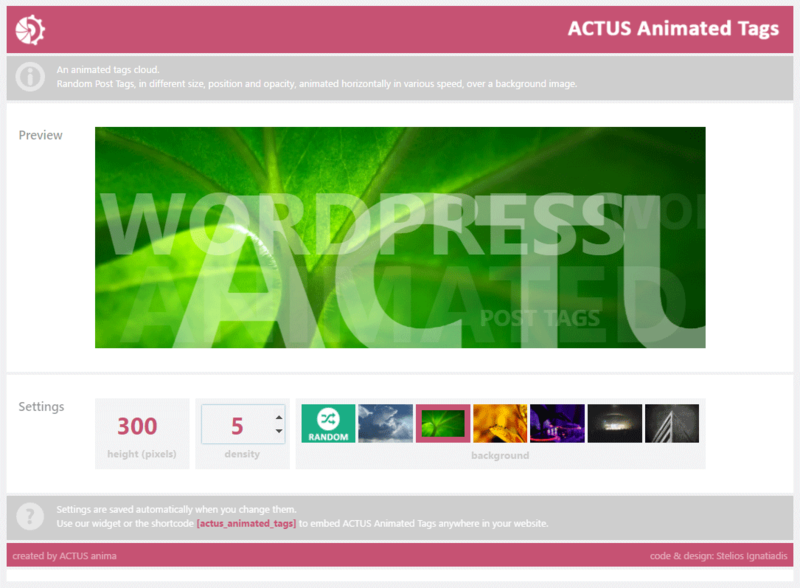 Place ACTUS Animated Tags widget in any slot you want. Looks promising. Unfortunately, the images don’t work with my site. Any way to customize images, or even have a plain colored background? You mean the images have some problem loading or that they don’t match your site? I will add the ability to customize images in a new version.